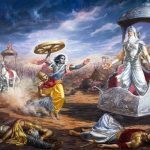 Brahmanas, kshatriyas, vaishyas and shudras are distinguished by the qualities born of their own natures in accordance with the material modes, O chastiser of the enemy. 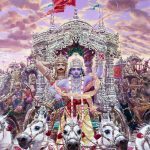 However, the living body filled with the three gunas becomes successful by worshipping the Supreme Lord by prescribed activities according to his nature. This is described in six verses. These activities or duties, designated precisely (pravibhaktani) by the gunas of sattva, rajas and tamas, which manifest by birth (svabhavena), are prescribed for the brahmanas, ksatriyas, vaisyas and sudras. 18.41 The nature of Brahmanas, Ksatriyas, Vaisyas, and Sudras are due to their respective inherent dispositions. The meaning is that their past Karma has been the cause of determining births as Brahmanas etc. The Sattva and other Gunas are the result of such Karma. The Sattva-guna is born from the inherent nature of the Brahmana becoming dominant by suppressing the qualities of Rajas and Tamas. The quality of Rajas originates from the inherent nature of the Ksatriyas becoming dominant by suppressing qualities of Sattva and Tamas. Tamoguna arises from the inherent nature of the Vaisya, becoming dominant in a little way by suppressing Sattva and Rajas. The duties and works assigned to them according to the Gunas constituting their inherent nature, are expounded and allotted by the Sastras in the order described. For the Sastras analyse that the Brahmanas etc., possess such and such attributes and such and such are their duties and occupations. Now Lord Krishna commences a new theme with this verse explaining that the duties of the different classes of Vedic society such as brahmana or priestly class, ksatriya or royal and warrior class, vaisya or agricultural and mercantile class as well as sudra or menial worker class which is the only one not qualified to take part in any Vedic activity as they serve the other three classes. The duties enjoined for all the classes are clearly delineated and itemised with distinct divisions. 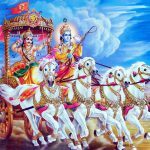 The typical duties of all the four classes will be described according to the predominating influence of the three gunas which manifest the corresponding nature determined by the tendencies acquired in past lives and the impressions from the attendant karma or reactions to actions. The brahmins have a predominance of sattva guna, the ksatriya’s a predominance of raja guna with a little sattva guna, the vaisyas with raja guna mixed with tama guna and the sudras with a predominance tama guna and a little raja guna. Paramahamsa’s are known by their tranquillity, self-control and inherent righteousness. The demigods such as Brahma, Surya, Ganesh, etc. even though extremely passionate rarely exhibit any signs of passion because even when engaged in passionate acts their minds are constantly in communion with the Supreme Lord. As far as others are concerned due to the fluctuating nature of their minds their actions are usually equated with raja guna the mode of passion; yet when their minds are fixed upon the lotus feet of the Supreme Lord then they too can be considered situated in sattva guna. Inquiry into the eternal principles of the Vedic scriptures and performing prescribed ritualistic activities are the special attributes of the brahmacari’s aspiring for the ultimate truth. Assuming familial activities, maintaining a wife, producing children are the symptoms of the grihastas. Becoming detached, giving up attachment to grown children and residence along with all conceptions of father, mother, wife, husband and wholly reflecting on the Supreme Lord are the expressions of vanaprasthas. 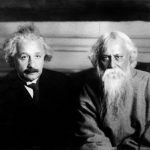 For the sannyasi’s the absolute equanimity expressed towards all living entities is the symbol of their advanced development. The Brahmins the priestly class, the ksatriyas or royal warrior class and the vaisya’s the mercantile and agricultural class are all spoken of in unison because they only have the right to initiation making them qualified to study the Vedic scriptrures, engage in yagnas or ritualistic propitiation and worship. 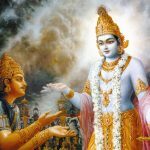 Whereas the sudra or servant class are mentioned separately as they have not the qualification for initiation and study of the Vedic scriptures but all are factually the product of their own innate natures. brāhmaṇa — of the brāhmaṇas; kṣatriya — the kṣatriyas; viśām — and the vaiśyas; śūdrāṇām — of the śūdras; ca — and; param-tapa — O subduer of the enemies; karmāṇi — the activities; pravibhaktāni — are divided; svabhāva — their own nature; prabhavaiḥ — born of; guṇaiḥ — by the modes of material nature.